Your houseplants are treated better than mine. 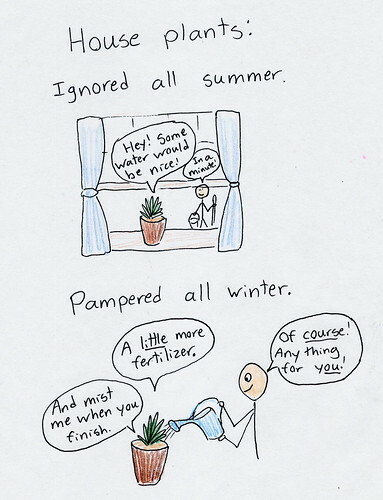 I ignore them summer & winter. The only reason they're still alive is that I put them outside as soon as it's warm enough & don't bring them in until October. Hey, you've been looking in my windows again, haven't you? This one rings a little too true. Although in the winter, sometimes mine say "Leave me alone, please, I am not thirsty yet. You just watered me a few days ago" Or "Hey, don't put those ornaments on me, I'm not your Christmas tree!"